A new nasal spray offering fast and powerful symptomatic control of allergic rhinitis (AR) has been launched in the UK by Meda Pharmaceuticals. 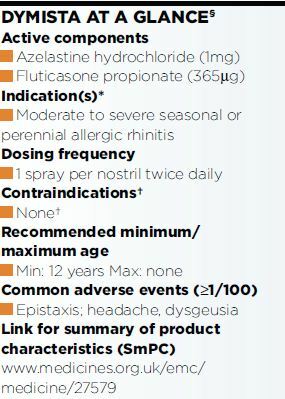 Dymista®, a novel formulation of fluticasone propionate and azelastine hydrochloride, is licensed for the symptomatic treatment of moderate to severe seasonal and perennial AR where monotherapy with either intranasal antihistamine or glucocorticoid is not considered sufficient. The efficacy and safety of Dymista has been documented in several studies involving over 4000 patients, 1400 of which received the new formulation. According to GP and allergy expert Dr Dermot Ryan, effective management of AR remains a challenge for both healthcare professionals and patients. important development in improving the management of such a common but difcult to manage condition,” he said. Please note: The information presented for the drugs featured is not comprehensive and is taken from information provided by third party sources. For full information about any drug featured, including special precautions, please see the full summary of product characteristics using the link shown and/or consult the manufacturer. excipients is a contraindication for all drugs. 2. Carr W et al. J Allergy Clin Immunol. 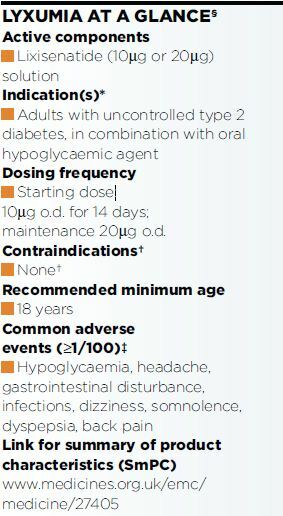 A new once-daily parenteral hypoglycaemic is now available in the UK for the management of uncontrolled type 2 diabetes in combination with oral hypoglycaemics and/or insulin. Lyxumia (lixisenatide) is the first prandial glucagon-like peptide-1 (GLP1) receptor agonist to be developed, and with a competitive price tag, may represent a cost- effective option for the NHS. Lixisenatide has been shown to slow down the process of gastric emptying, and thereby lower blood sugar after a meal. The approval of the new agent is based on a comprehensive trial programme, which included 11 clinical studies and more than 5,000 patients. Results from Phase 3 trials showed that a combination of lixisenatide with basal insulin, plus oral antidiabetic agents such as metformin, signicantly reduced levels of HbA1c, compared with placebo, in patients with type 2 diabetes. It also reduced postprandial fasting glucose compared with baseline. medroxyprogesterone acetate (MPA) has been launched in the UK. Sayana Press is injected into the thigh or abdomen every 13 weeks using a prelled device (Uniject®). MPA is a steroidal progestin, a synthetic variant of the human hormone progesterone, which prevents ovulation and provides contraception for 13 weeks (+/-1 week). In the two phase 3 clinical studies of 1787 women, no pregnancies were reported with subcutaneous MPA. Over half of the participants in the studies experienced amenorrhea after 12 months, and over half of women did not report any signicant weight changes while taking subcutaneous MPA. In adolescents (12-18 years), use of Sayana Press is only indicated when other contraceptive methods are considered unsuitable or unacceptable. NICE has published a nal appraisal determination (FAD) recommending the use of the novel once-daily oral hypoglycaemic dapagli!ozin as a treatment option for adults with type 2 diabetes. The guidance supports the use of dapagliflozin as dual therapy in combination with metformin, and in combination with insulin with or without other oral antidiabetic drugs. In combination with metformin, dapagli!ozin is recommended for use in place of a sulphonylurea (SU) for patients in whom an SU is not tolerated or contraindicated, or those who are at signicant risk of hypoglycaemia or its consequences. The addition of dapagliflozin to metformin may also be preferable to a thiazolidinedione if further weight gain is a concern. Dapagliflozin is the rst in a new class of treatments known as SGLT2 inhibitors, which work independently of insulin with a mechanism of action that reduces the amount of glucose reabsorbed in the kidney. Measures to restrict the use of codeine-containing medicines for the management of pain in children were among three recommendations on pain management drugs to emerge from the annual meeting in June this year of the European Medicines Agency (EMA)’s Pharmacovigilance Risk Assessment Committee (PRAC). The recommendations regarding codeine seek to ensure that such medicines, which have been associatedwith respiratory depression, are used only in children for whom the benets are greater than the risks. They include codeine-containing medicines should only be used to treat acute to moderate pain in children above 12 years of age that cannot be relieved by other simple analgesics. These medicines should not be used at all in patients aged below 18 years who undergo surgery for the removal of the tonsils or adenoids to treat obstructive sleep apnoea, as these patients are more susceptible to respiratory problems. The PRAC further advised that, as the risk of side effects with codeine may also apply to adults, codeine should not be used in people of any age who are known to be ultra-rapid metabolisers, nor in breastfeeding mothers. Diclofenac: the Committee warned that the cardiovascular effects of this NSAID when given systemically are similar to those of selective COX-2 inhibitors. This applies particularly when diclofenac is used at a high dose (150mg daily) and for long-term treatment. Flupirtine (oral and suppository formulations) should only be used to treat acute (short-term) pain in adults who cannot use other suitable pain agents (such as NSAIDs and weak opioids) and treatment should not exceed 2 weeks because of the risk of damage to the liver. The PRAC recommendation will need to go through a number of hoops before adoption of any EU-wide legally binding decisions.